The Chicago Blackhawks eliminated the Los Angeles Kings in five games in the 2013 Western Conference Final on their way to the Stanley Cup. To have a chance to become the first repeat champion in 16 years, Chicago will have to beat L.A. again. The Blackhawks and Kings, who each finished third in their division, begin the best-of-7 rematch Sunday at United Center (12 p.m. PT; NBC, TSN, RDS). The Blackhawks have been off since eliminating the Minnesota Wild by winning Game 6 of their Western Conference Second Round series in overtime. The Kings had a quick turnaround; Los Angeles flew to Chicago after ousting the Anaheim Ducks in Game 7 of their second-round series Friday. 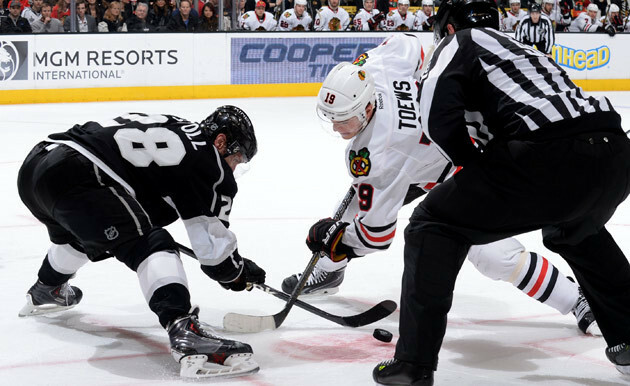 For the past two years, the Blackhawks have had much the better of their matchups; in addition to going 4-1 against the Kings last spring, Chicago swept three regular-season games in 2013-14, outscoring Los Angeles 9-4. The Blackhawks won 3-1 and 1-0 at home during a 15-day span in December before a 5-3 win at Staples Center on Feb. 3. Going back to the 2012-13 regular season, Chicago has won nine of 11 games between the teams. The Blackhawks have one of the most talented top-six units in the NHL, and coach Joel Quenneville is not shy about mixing and matching those players. Quenneville reunited Patrick Sharp (six points), Jonathan Toews (five goals, 10 points) and Marian Hossa (11 points) for the final two games of the second-round series. Toews scored the game-winner in Game 5, with assists from Hossa and Sharp, and the line was a matchup nightmare for Minnesota. Patrick Kane (team-high six goals) anchors the second line and might be the most dynamic scorer left in the Stanley Cup Playoffs. Kane has scored three series-winning goals. Late in the series, Kane was joined by Brandon Saad and Michal Handzus on a revamped second line. Bryan Bickell, who has six goals, played third-line minutes in that alignment. It is the rest of the bottom-two lines that have caused consternation for Chicago, a problem exacerbated by the injury to Andrew Shaw, who has started skating again after sustaining a lower-body injury in Game 1 against the Wild. Peter Regin was inserted into the lineup late in the second round and had some good moments. Kris Versteeg has been in and out of the lineup this postseason but scored the first goal in Game 6 against Minnesota. Anze Kopitar and Marian Gaborik have turned out to be a dynamic force on the top line since Gaborik arrived prior to the NHL Trade Deadline. Kopitar began the playoffs with a 10-game point streak and, although he didn't score a goal in the second round series until a blowout Game 7, had eight assists. All Gaborik has done is lead the League with nine goals in 14 playoff games after he had 11 goals in 41 regular season-games. Kopitar won 27 of 41 faceoffs in the final two games of the second-round series against the Ducks, and the duo ended up outshining Hart Trophy finalist Ryan Getzlaf and former Hart winner Corey Perry. There is some fallback, production-wise, after that, but the contributions are timely. 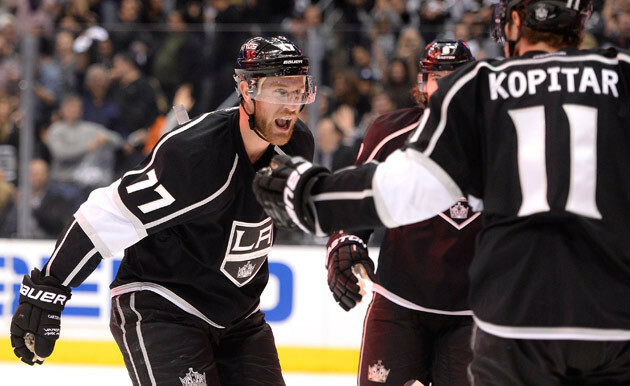 Jeff Carter and Trevor Lewis each have four goals in the playoffs, and most of them have been clutch. Carter is usually flanked by Tanner Pearson and Tyler Toffoli, and the line flourished early in the postseason. The bottom six is full of the usual blue-collar grit, but coach Darryl Sutter made a key move early in the playoffs and spread out Justin Williams and Mike Richards for more balance. Williams, like clockwork, displayed his penchant for clutch play with the first goal in Game 7 against Anaheim. They have been the saving grace at both ends of the ice for the Blackhawks, with the top four effective in all three zones. Brent Seabrook, who missed three first-round games with a suspension for a hit against the St. Louis Blues, is tied with Hossa for the Blackhawks scoring lead (11 points). Duncan Keith, who plays 27:57 per game, has eight points. That pair is a plus-8 in the postseason. The next pair, Johnny Oduya and Niklas Hjalmarsson, might be more valuable because they usually are used in a shut-down role. They have six points combined but have kept the opposition in check. Hjalmarsson has 38 blocked shots, more than any defenseman left in the playoffs. The Blackhawks have used three defensemen to fill the final two spots. Presently it is Nick Leddy and Sheldon Brookbank, who played well during the suspension of Seabrook. Leddy was scratched for one game because Quenneville wanted to see a more hard-nosed game from him. Rozsival did not play the final two games of the Minnesota series after committing several turnovers in Game 4. The Kings are relying heavily on the top pairing of Drew Doughty and Jake Muzzin in the wake of injuries to Willie Mitchell and Robyn Regehr. Mitchell has begun skating but it is unknown when he will return from a lower-body injury. 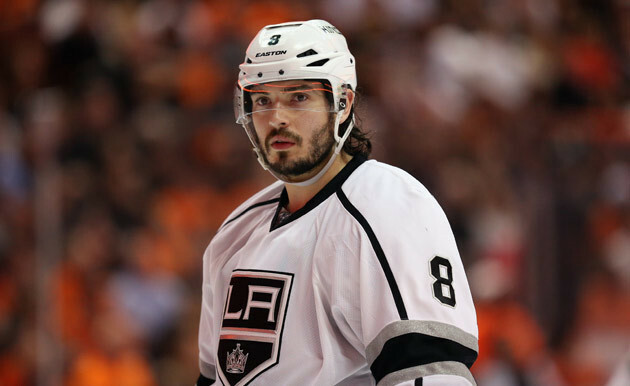 Doughty is used to the workload but the Kings are running thin when he's in the penalty box. Muzzin has grown more into his larger role and leads Kings defensemen with three goals, but has an occasional lapse. Jeff Schultz has been pressed into action in the second pairing because of the injuries. He is a big body but he's also slow and might struggle against Chicago's speedy forwards. Alec Martinez has provided punch from the blue line. He has more goals than Doughty (2-1). Schultz's partner, Slava Voynov, has mostly been a disappointment after several effective playoffs. Corey Crawford often is the forgotten part of the Chicago equation in the wake of all the talent among the skaters playing in front of him. But Crawford has been very good this season. He has stolen games instead of just hanging around and letting the Blackhawks' potent offense win them. He was not very good during the first two games in Minnesota, allowing seven goals during a four-period stretch from the third period of Game 3 to the end of Game 4, but he allowed one goal in each of the next two, including 34 saves in Game 5. For long stretches this postseason, Crawford has been the elite goalie the Blackhawks have craved. His .931 save percentage ties him for the playoff lead with Henrik Lundqvist of the New York Rangers, and his 1.97 goals-against average is the best among goalies with more than five appearances. The opening games of the first-round series seem like months ago for Jonathan Quick, who righted himself after he allowed 16 goals in the first three games against the San Jose Sharks. Quick has allowed 20 goals in the past 11 games, one or zero five times in that span. The Kings have gotten back to their lockdown defensive game in front of Quick and can afford some breaches on their penalty kill because Quick is there to make up for it. Quick appeared to fully get his swagger back in Game 7 when he stopped Perry on a penalty shot and a breakaway. They don't come much better than Quenneville, who coached Chicago to the Stanley Cup championship in 2010 and 2013. He has more elite-level talent than many of his peers, and he finds a way to get the most out of that talent. This postseason, he has coached his way around suspensions to two players, a 2-0 series hole against the favored Blues, and the injury to Shaw, one of his most versatile forwards. Quenneville is ready to change things at any time, mixing forward lines like a mad scientist, usually with a big payoff instead of a disastrous meltdown. After coaching 174 Stanley Cup Playoff games, and winning 98 of them, nothing is going to surprise Quenneville at this time of year. Sutter comes across as a simple farmer but he probably doesn't get enough credit for making the right adjustments. He put young players Pearson and Toffoli with Carter and moved Richards to the fourth line, each a shrewd move. The Kings defense held up despite the loss of the stay-at-home, penalty-killing Mitchell and Regehr, and Los Angeles got to Game 7 against Anaheim without getting a goal from Doughty, Williams or Dustin Brown. There is no ambiguity with a Sutter-coached Kings team. He puts his lineup out there and doesn't pay any attention to what the opponent does because it's all about his team sticking to what it does. This will be Sutter's 10th playoff series in three seasons, and Game 1 will be the 53rd game in that span. The Blackhawks are the League's stingiest team in the postseason killing penalties. St. Louis and Minnesota combined to score on four of 46 attempts in 12 games (8.7 percent). Chicago allowed one goal in 19 attempts in six games at United Center. The penalty kill had to be good because the Blackhawks are one of the most penalized teams remaining. Despite the offensive talent, the Blackhawks are in the middle of the pack on the power play, converting on 18.2 percent. Most of the struggles have come on the road; at home, the power play is clicking at 31.2 percent (5-for-16). A power-play unit which finished No. 27 in the NHL in the regular season has cashed in productively in the playoffs. The Kings are 11-for-48 and scored in nine of 14 games. Some of that has to do with Gaborik, who has two power-play goals but, more important, gives the Kings that extra goal-scorer the opponent needs to account for on the man-advantage. The Kings penalty-killing unit, usually a strength, took a dip when it allowed five power-play goals in Games 2-5 against Anaheim but rebounded when it killed all eight attempts in the final two games of the series. Sheldon Brookbank -- The defenseman is not called upon often, but Brookbank has had a major role so far in the 2014 Stanley Cup Playoffs. Since joining the Blackhawks for the start of the 2012-13 season, Brookbank has played 74 regular-season games, and one during Chicago's march to the Stanley Cup last season. This season has been different. He has played in six games in the first two rounds, spelling the suspended Seabrook in the first round and playing for Leddy and Rozsival in the second. Brookbank has played a simple, steady game, with two assists and a plus-4 rating, which has settled an unsure third pairing. If he continues to play in that manner, an already good defense becomes deeper. Jeff Carter – Gaborik has done his part to boost the Kings, who will need more than him to make a difference against Chicago. Now it's Carter's turn. He has been fairly quiet with four goals in 14 games, and if he can deliver timely scores like his breakaway in Game 7 in Anaheim, it will give the Kings a chance. 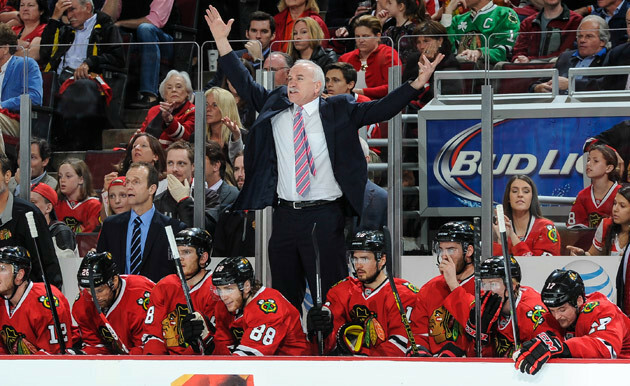 Blackhawks will win if … They stick with their game plan from the first two rounds. With the fifth-best record in the Western Conference and the seventh-best record in the League, Chicago is built to win in the playoffs. The Blackhawks are skilled at all the important positions, loaded with big-game experience, have an overabundance of confidence, and are unbeatable so far in six games at United Center. It is a recipe for success in late May and early June. Kings will win if … Their patched-up defense somehow contains Chicago's stable of fast, skilled forwards. Much of that will depend on slow-footed Schultz and Matt Greene to keep up and limit prime scoring chances because Quick can only be asked to do so much. Los Angeles was able to get by a skating team like Anaheim but Chicago poses just as much, if not more of a threat.